Now when you apply the same scriptures to those who celebrate Palm Sunday you get shady mathematics . They say Jesus ENTERED Jerusalem on Sunday. So Five days from Sunday will give you Thursday .According to their math , Passover was on Thursday. According to their math Jesus died after Passover SINCE PASSOVER IS ALWAYS ON WEDNESDAY NISAN 14 . A look at the scriptures and one finds that Jesus was betrayed before Passover Yet when you take up Palm Sunday math it tells you that Jesus was betrayed after Passover. So Jesus was betrayed before Passover .Yet if you take the Palm Sunday teaching Jesus was betrayed AFTER Passover because 5 days after Palm Sunday is one day past Passover. Palm Sunday is just another Pagan lie in Christianity that has been baptized with twisted scriptures.The scriptures have spoken for themselves . Palm Sunday is about the triumphant entry of Tammuz, Nimrod, Horus and all the other pagan gods because the nations of the world worshiped the sun god deity . Palm Sunday is playing numerology that since Jesus rose again on Sunday(lie) Palm Sunday is seven days away from that day hence the umber 7 number of holiness .Yet Jesus entered Jerusalem n Friday 5 days before Passover. There is not one scintilla of divine authority for such unscriptural holy days as Palm Sunday and Easter. Thousands of people throughout the world observe these days and seasons with zeal, promptness, and precision, while at the same time, they reject God's commands to obey the gospel by being baptized for the remission of their sins and living daily the kind of lives in harmony with the will of Jesus, the Son of God. They observe unauthorized days, but reject divine commands. Remember, it is sinful to make holy that which God did not make holy, and it is sinful to make unholy that which God made holy. How much vain labor of divine teaching is bestowed upon those who pursue either or both of these ways! They are the ways which seem right to men, but they are the ways of death (Prov. 16:25). May we never be guilty of making any day or season holy which God has not made holy, and may we be equally sure that we never relegate any of God's commands to the realm of the unholy. 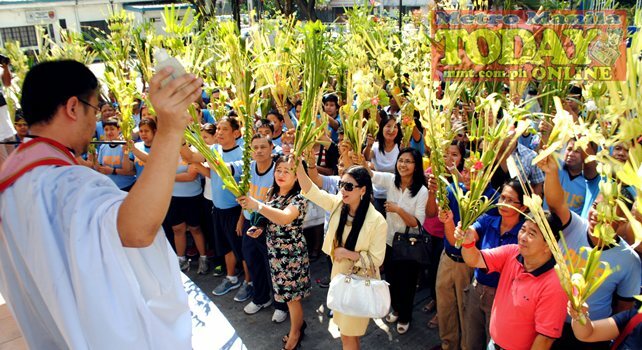 PALM SUNDAY AND ITS REAL SHOCKING MEANING, READ AND BE INFORMED!